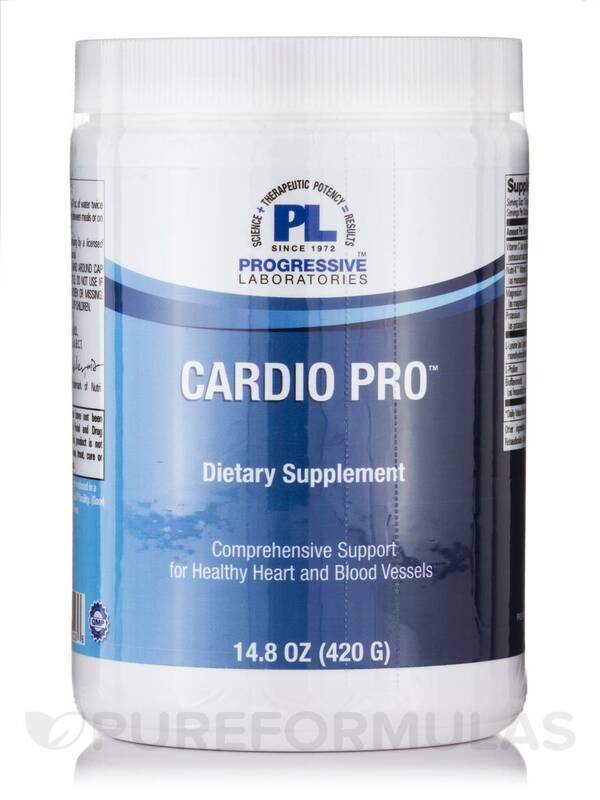 Cardio Pro is a uniquely designed‚ powerful‚ nutriceutical formulation‚ which contains L-Lysine‚ L-Proline‚ Magnesium and Potassium Ascorbates‚ Citrus Bioflavonoids and Menaquinone (Vitamin K2)‚ based upon the brilliant‚ scientific research discoveries of Dr. Linus Pauling and Dr. Mathias Rath‚ that significantly helps to prevent and promote the healing of atherosclerosis (hardening of the arteries) by controlling the free radical‚ oxidative‚ stress-induced inflammation‚ which underlies atherogenesis‚ affecting the blood vessels‚ heart‚ brain and other vital organ systems. Linus Pauling Ph.D‚ twice winner (laureate) of the Nobel Prize‚ and Matthias Rath‚ M.D.‚ published "A Unified Theory of Human Cardiovascular Disease Leading the Way to the Abolition of This Disease as a Cause for Human Mortality" that gives an explanation for the mechanisms of cardiovascular disease and provides a safe‚ effective and reliable way to control it. Dr. Linus Pauling is quoted as saying: "This disease is the direct consequence of the inability of man to synthesize ascorbate (vitamin C) in combination with insufficient intake of ascorbate in the modern diet. Since ascorbate deficiency is the common cause of human CVD‚ ascorbate resupplementation is the universal treatment for this disease. Further clinical confirmation of this theory should lead to the abolition of CVD as a cause of human mortality for the present generation and future generations of mankind." 1) Cardiovascular Disease (CVD) is the direct consequence of the inability for endogenous ascorbate (vitamin C) production in humans‚ in combination with low dietary ascorbate intake. 2) Ascorbate deficiency leads to increased permeability of the vascular wall by the loss of the endothelial barrier function and the degeneration and loosening of the vascular connective tissue. 3) After the loss of endogenous ascorbate production‚ scurvy and fatal blood loss through the scorbutic vascular wall rendered our ancestors in danger of extinction. Under this evolutionary pressure over millions of years‚ genetic and metabolic countermeasures were favored that counteract the increased permeability of the vascular wall. 4) The genetic level in humans is characterized by the fact that inherited disorders associated with CVD became the most frequent among all genetic predispositions. Among those predispositions‚ lipid and lipoprotein disorders occur particularly often. 5) The metabolic level is characterized by the direct relation between ascorbate and virtually all risk factors of CVD known in clinical cardiology today. Ascorbate deficiency leads to vasoconstriction and hemostasis‚ and‚ affects the vascular wall metabolism in favor of promoting atherosclerogenesis. 6) The genetic level can be further characterized‚ in that‚ the more effective and specific a certain genetic feature counteracted the increasing vascular permeability in scurvy‚ the more advantageous it became during evolution and‚ generally‚ the more frequently this genetic feature occurs today. 7) The deposition of alpha-lipoprotein [LP(a)] is the most effective‚ most specific‚ and therefore‚ most frequent of these pathologic mechanisms of atherosclerogenesis. LP(a) is preferentially deposited at vascular predisposition sites. In chronic ascorbate deficiency‚ the accumulation of LP(a) leads to the localized development of atherosclerotic plaques and predisposes to myocardial infarction and stroke. 8) Another frequent inherited lipoprotein disorder is hypoalphalipoproteinemia. The frequency of this disorder again reflects its usefulness during evolution. The metabolic up-regulation of HDL synthesis by ascorbate became an important mechanism to reverse and decrease oxidized lipid deposits in the vascular walls. 9) The vascular defense mechanisms associated with most genetic disorders are nonspecific. These mechanisms can aggravate the development of atherosclerotic plaques at vascular predisposition sites. 10) Other nonspecific mechanisms lead to peripheral forms of atherosclerosis by causing a thickening of the vascular wall throughout the arterial system. This peripheral form of vascular disease is characteristic for angiopathology associated with diabetes‚ Type III hyperlipidemia and many other inherited metabolic diseases. 11) Of particular advantage during evolution and therefore particularly frequent today are those genetic features that protect the ascorbate-deficient vascular wall until the end of the reproduction age. By favoring these disorders‚ nature decided for the lesser of two evils: the death from CVD after the reproduction age rather than death from scurvy at a much earlier age. This also explains the rapid increase of the CVD mortality today from the 4th decade onwards. 12) After the loss of endogenous ascorbate production in humans‚ the genetic mutation rate in our ancestors increased significantly. This was an additional precondition favoring the advantage not only of apolipoprotein A [APO(a)] and LP(a)‚ but also of many other genetic countermeasures associated with CVD. 13) Genetic predispositions are characterized by the rate of ascorbate depletion in a multitude of metabolic reactions specific for the genetic disorder. The overall rate of ascorbate depletion in an individual is largely determined by the polygenic pattern of disorders. The earlier the ascorbate reserves in the body are depleted without being re-supplemented‚ the earlier CVD develops. 14) The genetic predispositions with the highest probability for early clinical manifestation require the highest amount of ascorbate supplementation in the diet to prevent CVD development. The amount of ascorbate for patients at high risk should be comparable to the amount of ascorbate our ancestors synthesized in their body before they lost this ability: between 10‚000 and 20‚000 milligrams per day. 15) Optimum ascorbate supplementation prevents the development of CVD independently of the individual predisposition or pathomechanism. Ascorbate reduces existing atherosclerotic deposits‚ and‚ thereby decreases the risk for myocardial infarction and stroke. Moreover‚ ascorbate can prevent blindness and organ failure in diabetic patients‚ thromboembolism in homocystinuric patients‚ and many other manifestations of CVD. L-Lysine and L-Proline are essential‚ amino acid components of collagen‚ the primary‚ structural protein of blood vessels and connective tissues. 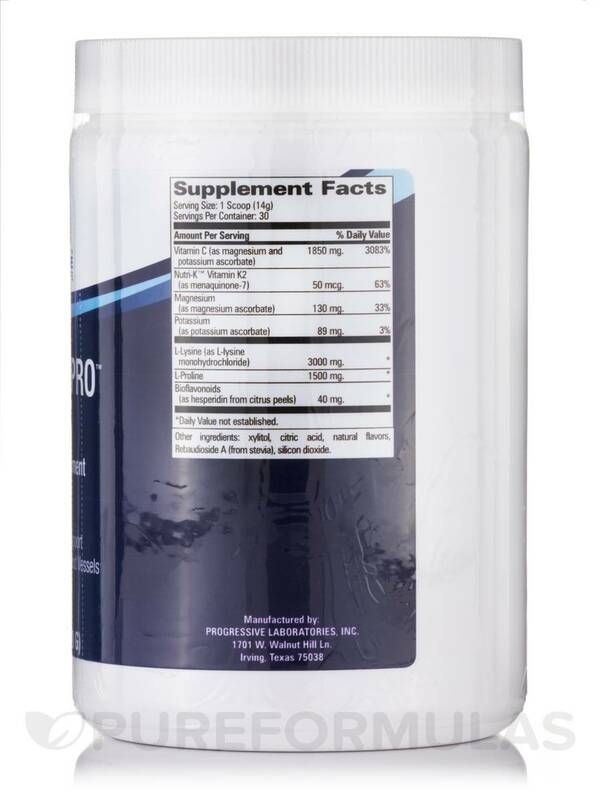 Their supplementation helps to repair the vascular endothelial lining and maintain structural integrity of blood vessels. Lysyl Residues attract apolipoprotein(a)‚ a known contributory factor to the development of atherosclerotic plaque. Lipoprotein(a) [LP(a)] readily adheres to these Lysyl Residues. Supplemental Lysine diverts LP(a) from adhering to the Lysyl Residues in the vascular endothelium towards the Lysyl Residues contained in "free" Lysine in the bloodstream‚ thereby helping inhibit atherosclerogenesis. Vitamin C is an essential nutrient in the formation and maintenance of healthy collagen. Magnesium ascorbate and potassium ascorbate provide essential minerals for normal enzyme function‚ healthy cellular metabolism and relaxation response of blood vessels. Citrus bioflavonoids optimize the bioactivity of vitamin C (ascorbates) in the body‚ and‚ enhance the strength and resiliency of collagen. Vitamin K2 is the collective term for a group of bioactive‚ vitamin K compounds called menaquinones. Vitamin K2 is the most biologically active form of vitamin K. It is also the most beneficial form for bone health maximization. Vitamin K2 (menatetrenone) can prevent fractures and sustains lumbar bone mineral density in osteoporosis. Vitamin K2‚ combined with vitamin D and calcium‚ has been used primarily as treatment or prevention of osteoporosis. Vitamin K2 is essential for the carboxylation of glutamate residues in certain proteins‚ to give carboxyglutamate. This modification allows the protein to bind calcium‚ an essential event in the blood-clotting cascade. Carboxylation of glutamate is also important in other proteins involved in the mobilization or transport of calcium. Vitamin K2 is more effective than vitamin K1 with respect to osteoclastogenesis. Likewise‚ hypocholesterolemic effects and the ability to slow atherosclerotic progression have only been observed with vitamin K2. This may be due in part to the geranylgeranyl side chain of vitamin K2‚ which is thought to inhibit the mevalonate pathway‚ thus preventing the prenylation of growth factors required for osteoclast activation in much the same way as nitrogen-containing bisphosphonates. Menaquinone (Vitamin K2) helps to remove the abnormal‚ metastatic calcification of the blood vessels and deposit the calcium into bone where it belongs. 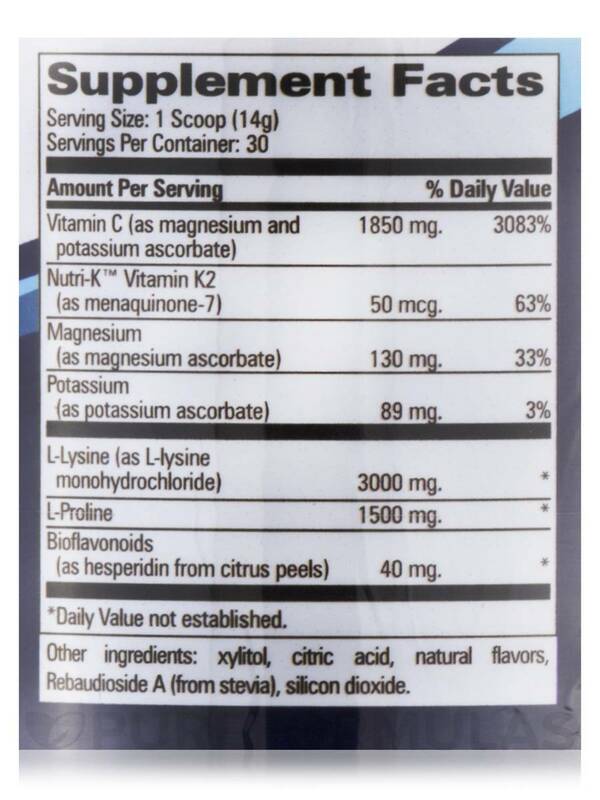 1 scoop twice daily; best taken between meals on an empty stomach if possible. 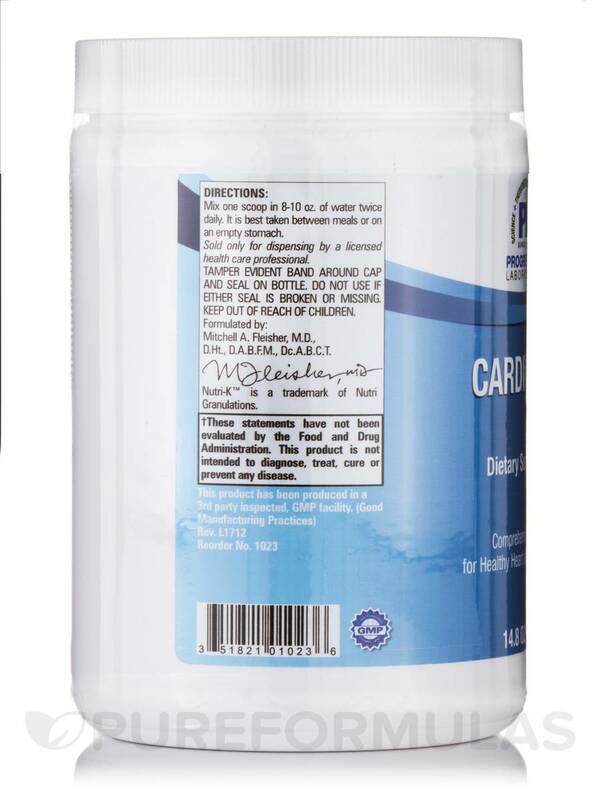 The ingredients contained in Cardio Pro are considered safe and very well tolerated when used as directed in the above-recommended dosage ranges. For years I have been suffering with swollen legs and ankles and on a bus trip from Miami to Orlando I thought I was going to die because of the pain in my legs. I called my "natural doctor" and he told me he was going to call a friend of his who happened to know a lot about my problem with the swollen legs. Let me tell you within 5 days from taking your product a miracle happened. I called my doctor to thank him and to thank his doctor friend for a "superior" product like Cardio Pro. I have taken many medicines and water retention pills to no avail but this one is the BEST THERE IS. I will recommend it to anyone who truly wants to alleviate their heavy swollen legs. 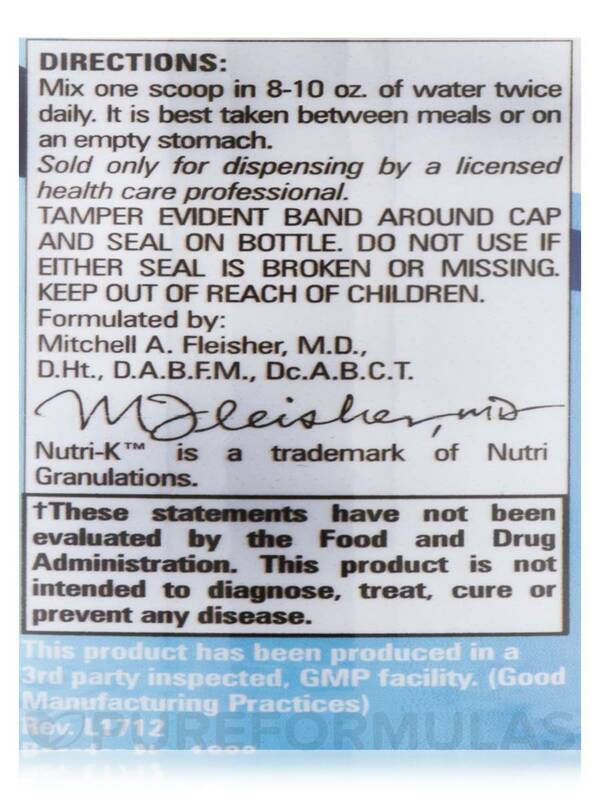 It is a good supplement that has been very helpful to me.